A sweeping historical book attempting to explain what the author sees as the “broadest pattern” of humanity’s ~12,000 years of history since the dawn of agriculture and settled societies. Describes how civilizations evolve basic features such as agriculture, writing, and government, and puts for a theory for why these evolved faster on some continents than others. 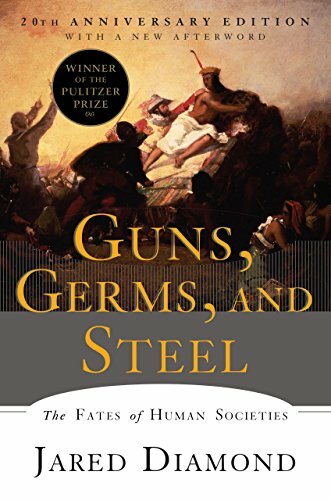 Guns, Germs, and Steel is a Pulitzer prize winner, well-known and highly controversial. I read the 20th-anniversary edition with at least one new chapter (on Japan) and a new afterword. The thesis in a nutshell is that civilization progressed fastest in Eurasia owing to geological/biogeographic factors. The argument, in as few words as I can summarize it, is as follows: Eurasia is the largest continent, and its primary orientation is east-west. This allowed a wide range of species to evolve, including many of the most domesticable plant and animal species. It also allowed for a large body of people to build up, making it more likely for innovations in agriculture and other aspects of civilization to arise. Finally, it allowed innovations to spread relatively quickly: having most of the continent in a temperate zone means that the same crops and animals can thrive in most places. These factors combined to give Eurasia a head start of several thousand years over Africa, the Americas, and Australia, all of which lacked some or all of these advantages. I enjoyed this book and I respect its goal and, for the most part, its methodology. However, Diamond has been criticized for being too much of an environmental determinist, and I think this criticism is fair. Recommended for the general reader.